Many close up subjects require precise control of lighting, often shadows are formed by side lighting or parts of the subect blocking the path of the illumination. It's for these reasons that ringflash was developed. It first appeared when a dental photographic specialist realised that a light closer to the lens would be more practical for their photography. The ringflash was born. Also called a macro flash, a ringflash is a flash unit with a doughnut shaped flash tube. It's positioned in front of the lens and the ring is usually larger than the lens diameter so you shoot through its centre. The direct light produced is virtually shadow free and even. 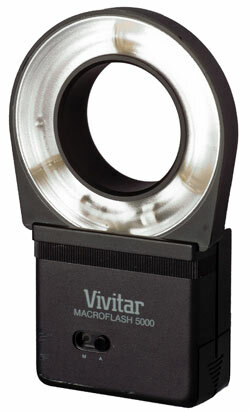 While the ringflashes was developed for dental photography it's popular with nature and portrait photographers. Versions of ringflash are produced by most camera manufacturers and studio lighting companies. For more info about ringflash and macro flash visit the Ringflash website.